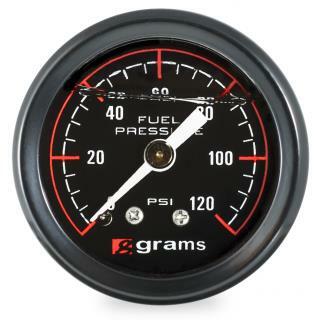 Compliment your fuel regulator with the Grams fuel pressure gauge. This easy to read, matte black stainless steel gauge measures your vehicles’ fuel pressure and is glycerin filled to accommodate applications with the highest vibrations. While adjusting the regulator, the Grams Fuel Pressure Gauge will provide you an accurate fuel pressure reading at a glance.